Makalani (Heavenly View) Cottage is a delightfully romantic cottage surrounded by a tropical garden in South Kona's coffee-belt with a breathtaking panoramic view of the Pacific Ocean. For the adventurous traveler seeking authentic Hawaiian beauty and serenity, you can spend your whole vacation here gazing out over the endless ocean and its incredible sunsets. In the winter, you can spot whales breaching from your outdoor lanai or listen to them singing at night. Awaken to the music of colorful birdsong from papaya, mango and banana trees. With a perfect year-round climate, perched at 1200 ft. above the sea on the side of Mauna Loa Volcano, Makalani Oceanview Cottage is authentic Hawai'i unspoiled by crowds and resorts. A great location that gives you many options for experiencing The Big Island's natural diversity. From your cottage you are just 4-minutes from the closest beach and 15-minutes to Ho'okena Beach State Park for sunbathing and swimming with dolphins. A 20-minute drive brings you to the famous Pu'uhonua o'Honaunau (Place of Refuge) National Historic Park and Kealakekua Bay where you can kayak to Captain Cook's monument and snorkel with an endless variety of tropical fish and sea turtles. And best of all, you're only 65-minutes from Madame Pele's live action at Volcanos National Park. Your cottage is tastefully appointed with Indonesian teak furniture providing a romantic comfort reminiscent of Colonial British tropics. Your large open-room (studio) cottage sleeps two luxuriously with a romantic king-size canopy-bed with a memory-foam mattress fit for royalty. There is also a convertible couch-futon which can comfortably sleep two additional guests. You'll have a fully-equipped kitchen as well as dining area for four. A large outdoor lanai with barbeque gives you garden seating with a stunning ocean view. Your detached private bathroom with semi- outdoor shower will provide a refreshing Hawaiian experience with nature. 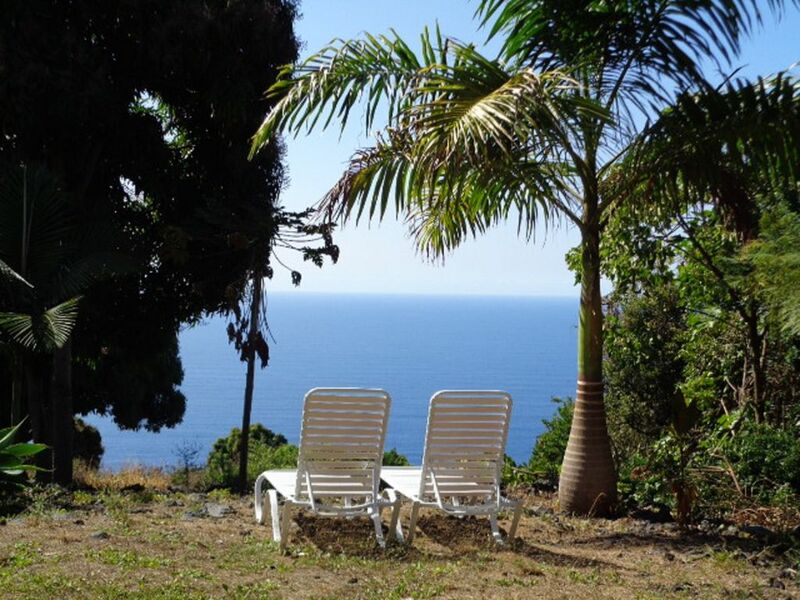 There is also a detached guestroom/meditation room available which is set in a grove of mango trees overlooking the ocean, called the 'Mango Grove Lookout'. It has a sofa-futon which can comfortably sleep one or two people. Serene and magical, this special extra-room provides daytime privacy as well as an intimate camp-like Hawaiian sleeping experience. Managed with aloha spirit, Makalani Oceanview Cottage is the perfect vacation/retreat cottage where you'll find yourself surrounded by the natural beauty of Hawaii. We hope your stay here will be the first of many happy vacations to South Kona and this beautiful island of Hawaii. I love Hawaii and sharing it with friends and guests, especially those who appreciate the spirit and mana of the island. To be in authentic and natural Hawaii,close to the ocean and untouched by tourists, hotels and resorts. I love the ocean and the secluded beaches nearby with the wonderful trails leading to them. It feels like 'Old Hawaiiana'. The sounds of the birds, wildlife and whales singing at night in the winter makes you feel like you're in the great outdoors. The tropical garden and romantically furnished interior provide a unique comfort. Lots of wonderful wildlife to encounter. private bldg. within 6-steps next to main cottage (5' from cottage). Breathtaking panoramic view of The Pacific Ocean through a grove of mango trees. Available for emergency calls only. Depending on your provider, most cell-phones work but may be intermittent with service. Dish satellite TV with Basic and Showtime premium channels. Attached to Mango Grove Lookout w/hanging lounge chair. The private detached bathroom has full semi-outdoor shower. A detached meditation room/guestroom set in a grove of mango trees overlooking the ocean provides additional serenity to your stay. Other Activities: Kayaking, Boating, Wildlife Viewing.